Links to other pages in my website and also to other websites that I like and recommend. Videos and music I have made or like. Writings, photos, audio, etc., from Reslife's colorful past. In April, 2011 Kathy and I moved to Mongolia with the blessing of our home church, Resurrection Life Church in Santa Ana, California, to serve the Lord in a new capacity. Since then, Resurrection Life Church has done a major change to their website. Nevertheless, there are some people who would like to be able to refer back to many of the photos, messages and writings that aren't included in the new website. Since I was the one who developed and maintained the original website from its beginning until Kathy and I moved to Mongolia, I felt it would be good to make these pages available again. I hope you find them worthwhile! Updates from this ongoing ministry in Zimbabwe, Africa. Our friends John and Celia Valentine live in Zimbabwe, Africa and operate a farm there and Bible college there. The work is a blessing to many and has helped to raise up many men and women to be ministers of the gospel in Zimbabwe and other places. They send out regular updates several times a month, describing the joys and heartaches of life there. I am happy to post these updates and photos for all to see. The updates are posted here, with the most recent shown first. Updates before 2011 were shown in the Resurrection Life Church website before it was revised by them. Those past updates are now available in the Resurrection Life Church Chronicles pages of my website. To help people in financial need in Mongolia and other places. Random files I have uploaded to a webpage so they can be available to you. A collection of John and Charles Wesley's wonderful songs. Hymns of Eternal Truth is a collection of John and Charles Wesley's songs that were written in the 1700's. Resurrection Life Church in Santa Ana, California, where I was the pastor for about 25 years from 1986 to 2011, has used the Hymns of Eternal Truth for many years. We have loved the songs because of the solid, deep, clear truth that is in them, and for the strength of many of the tunes. The book was put together by a man named George North, dear to many of us for his love for Jesus, his exemplary love for his fellow man, and his tenacious and courageous grip on the truth in Jesus that I love so dearly. A stirring and encouraging daily devotional by Oswald Chambers. Chambers was a brilliant man who loved God with a passion and taught vibrant Bible teachings in Egypt and other places where he spent time as a missionary. It doesn't take long to read each day, and when you click on the link, it will immediately take you to today's reading. Free downloadable Bibles and aids in many languages for computer or PDA! Birney Dibble has led a very interesting life both at home and abroad. He practiced medicine as a surgeon throughout his life and has gone with his family to various parts of the world as a medical missionary. He has written many books, and you can read about them or order them from his website. 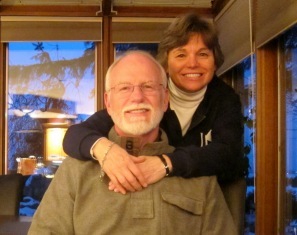 My brother Jim and his wife Ginny's counseling practice in North Carolina.